In addition to chasing wild tanks, we have also gotten to experience the fun of hunting down scared and stupid chickens after a critter raid. Did I mention that chickens are stupid? Not really important to this story, but still true. My sons have a colorful flock of chickens that are allowed to roam and scratch for bugs under cow poop and tree leaves. Each evening, the birds lollygag their way back to a comfy building where three boys appear to make sure there is clean water, feed (to supplement the bugs), and to secure the doors so nasty creatures cannot have chicken dinner. Son #3 (8 years old) and I were home alone one day while hubby and the older boys visited family. After returning from errands,we noticed it was near sunset and went out for chores. At that time of day, the chickens are usually roosting in their perches and waiting patiently for their human caretakers. As soon as we drove up, something was clearly wrong. The rooster was still running amok. 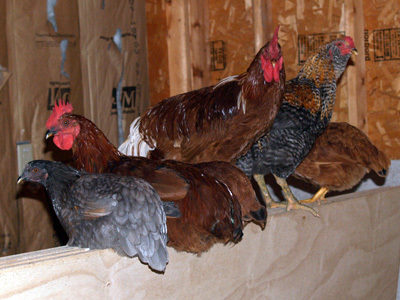 When we looked inside the coop, there were only 3 hens…..and a large assortment of feathers strewn around the floor. [There were supposed to be 30 chickens waiting for us to close the door.] I should mention here that normal roosters are not good for much, but they are usually adept at rounding up their hens and warning them of impending danger. Our rooster is really adept at finding a high perch, safely above the carnage around him. Son and I immediately began looking around. Over the next hour we located and caught as many birds as we could. Some had been so frightened that they wedged themselves into nooks or crannies and could not move. We had to forcibly pull them out to free them. Others heard our voices and would cautiously utter a “bawk, baaawk” before waddling out from under a log or other hiding spot (usually so close that we should have seen them!). Long story short….it took 24 hours to account for all birds. Twenty-nine were alive and one was dead. We think it was a raccoon (explained further below). Update: Six weeks after I started this story, we reinforced the chicken accommodations, adding a fence and live trap. The fence is more to keep the chickens close together than a real deterrent for critters, but it has worked pretty well. We also located and destroyed a raccoon nest with 8 babies…..ironically located in the tree closest to the chicken coop.It hasn’t deterred Momma Raccoon. As a matter of fact, she seems rather hell-bent on revenge, but I imagine that is to be expected. We have had two more “chicken hunt” situations in the past few weeks; fortunately, with no more loss of bird life. In addition, farm dog has received a couple of long lectures about the conditions of her continued employment. I am already making plans to turn the chicken coop into a greenhouse.